The apartment project consists of multi-storey buildings that wrap-around two multi-level parking garages, creating numerous on-grade courtyards, each designed with a unique landscape theme. 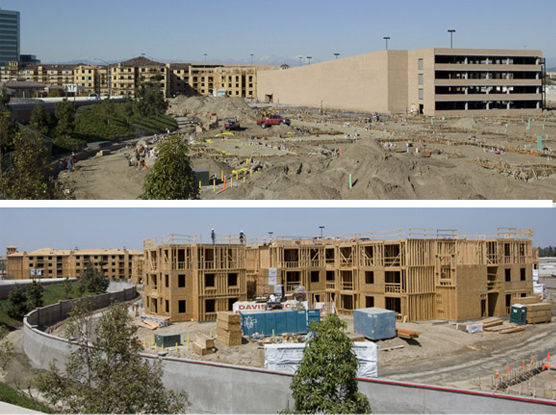 Two concrete parking structures accomodate 1,670 cars for a 845-unit, multifamily residential project on a 19-acre site that straddles the boundary between the cities of Anaheim and Orange, CA. The design-build post-tensioned concrete parking structures consist of a 312,000 sq. ft., 6-level parking structure for 1018 cars in the City of Anaheim and a 204,000 sq. ft. 5- level parking structure for 652 cars in the City of Orange. Klorman Construction’s experience helped to expedite navigation through a complex approval and permitting process that required separate planning and permit approvals from both cities’ building department and other governing agencies. Any requirements from one city had to be agreed upon by officials from the other city.